it's my girls' world: Currently--- oh and happy birthday, me! 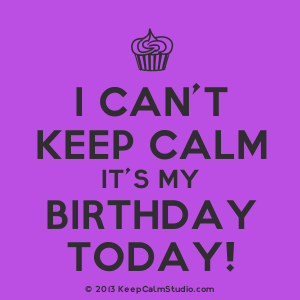 It's my birthday! And we're moved in! Two check marks all at ones. I love to do these currently posts on my birthday. It's fun to look back at last year's and see how things are changed. thinking | that's I'm a more adult adult (if that makes sense) after this move- there was so much we got done. drinking | I need to drink some more water but I'm seriously running around so much, I'm not getting a chance to... Oh and I'm drinking at least a coffee a day! That's huge for me as I'm usually a tea drinker but I'm finding I'm needing that jolt! reading | nothing too much since I've been so busy. But when I get a chance I want to continue my Marie Kondo book. wanting | some more green in my life and in the new house. looking | well we were trying to get caught up on How to Get Away with Murder and Nashville but my brother disconnected the basement TV for us- little did we know that it held the main PVR so all my shows got erased. #firstworldproblems. We were so busy night and day for the past few days thought that we wouldn't have been watching TV anyways. listening | If I needed you by Joey and Rory. Their story breaks my heart and inspires me all at once. And my kids LOVE it. Especially A.
trying | not to lose it through all the moving stuff. I have my moments though... Like yesterday when I went through the Tim Hortons' drive thru, paid for my stuff and drove right through without collecting it only to realise I forgot when my kid asked for her soup. Yep #losingit. wishing | for some very good R&R sometime real soon. planning | our plan for our new home-- short term and long term. enjoying | purging my stuff! And writing this post- I've missed you guys! day dreaming | of all the happy memories we've made in our old house. Such a lovely home! waiting | (not so patiently) for the new house to be painted, my backsplash to be done, my hot water to be fixed, my stove to be installed and the unpacking to be done--- I won't lie--- we've made some awesome progress! liking | a homemade deodorant D's cousin gifted me for Christmas. 4 ingredients and it works!! wondering | how long I can get away with only using my slow cooker/oven... We have NO stove. needing | to start back my total clean eating--- Mexico is coming up and I'm NOT ready! wearing | lots of leggings and tunics- so easy to move around in. And fleece leggings that I got for Christmas! noticing | that I did 19400 steps yesterday with all the moving stuff! And that's with no workout. pinning | nothing... but I will begin to pin slow cooker stuff. smelling | not one thing. I have my usual January cold. thanking | God for a beautiful, bountiful year. Pretty low key birthday planned with family. I'm seriously so tired I didn't want to go out. D and I go to dinner for a bit though and oh yeah, word on the street is that I get chocolate truffle cake! Happy birthday!! Hope your cold goes away soon!! Happy Birthday!! Loved your Tim's Drive-thru story! Happy birthday Sarita! I hope your girls and hubby spoil you this weekend! Oh I know moving is always a pain because it ruffles all the feather but it hope it goes as smoothly as possible. Happy birthday!! Hope you get some downtime this weekend! Happy Birthday!! I was cracking up at the Tim Horton's drive thru bit. Did you wind up going back or did the employees just get a free meal? Wishing you guys a smooth move. Happy Birthday sweet friend! I hope you had a amazing birthday/weekend! Happy happy birthday to YOU (belated)! Hope you had a wonderful weekend celebrating! You are blessed with a new beginning for your birthday, congratulations and enjoy your new home.